Senate President Michael Thibodeau (from left), Speaker of the House Sara Gideon and Gov. Paul LePage. AUGUSTA, Maine — The resolution of the budget impasse that threatens to shut down state government lies in the hands of six lawmakers who were appointed Tuesday evening. 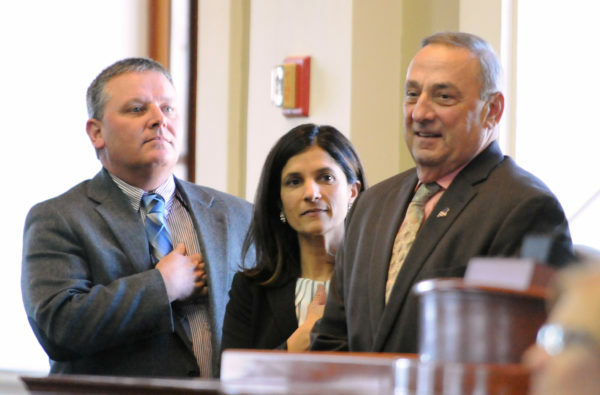 Both Republican Senate President Mike Thibodeau of Winterport and Democratic House Speaker Sara Gideon of Freeport named themselves to a conference committee that was formed Tuesday after budget negotiations broke down and the House and Senate backed widely different versions. In addition to herself, Gideon named Appropriations Committee members Rep. Aaron Frey, D-Bangor, and Rep. Tom Winsor, R-Norway, to the committee. Thibodeau also named two Appropriations Committee members to the committee: Sen. Roger Katz, R-Augusta, and Sen. Catherine Breen, D-Falmouth. The committee held an organizational meeting at 7 p.m. Tuesday at the State House and agreed to begin work in earnest Wednesday at 9 a.m., beginning by identifying a list of issues that have caused disagreement. Democrats and Republicans have failed to reach accord on a $6.8 billion two-year budget initially introduced by Republican Gov. Paul LePage in early January. After the Appropriations Committee deadlocked and presented three budget recommendations, procedural votes Monday in the House and Tuesday in the Senate resulted in creation of the six-member conference committee. A budget must be in place by July 1 to pay for government services in the fiscal year that begins that day. In order to give lawmakers time to vote on a new spending plan and the likely veto from LePage, they must pass a budget bill with two-thirds support in both chambers by Friday or very soon thereafter.